The choice of an appropriate comparative strategy is critical for appropriate testing of adaptive hypotheses. Two major comparative methods can be employed to show evidence of adaptation (Brooks & McLennan, 1991): (a) comparing traits associated with an ecological role in closely related species that have diverged ecologically and (b) comparing traits associated with an ecological role in distantly related species that have converged on similar ecologies. While the first comparative method is frequently employed to understand associations between anatomy and behavior among primates (Daegling, 1992; Fleagle, 1977a,b, 1979; Fleagle and Meldrum, 1988; Rodman, 1979; Ward and Sussman, 1979), the second one is less commonly used by physical anthropologists. 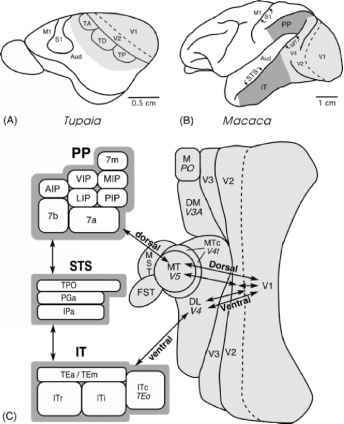 There are exceptions, such as Erikson's (1963) study showing similarities in forelimb morphology between Ateles and Hylobates associated with suspensory locomotion and posture, or Cartmill's (1974c) study pointing out similarities in skull and digit morphology between Daubentonia and Dactylopsila associated with grub extraction from tree bark. The convergent evolution of similar traits in similar environments in distantly related lineages has been argued as one of the strongest sources of evidence for adaptation (Brooks and McLennan, 1991; Biewener, 2002; Larson and Losos, 1996; Vogel, 1998). Such comparative strategy is especially well suited to understand the adaptive significance of traits linked with the origin of primates. Since prehensile hands and feet are most likely to have characterized the last common ancestor of all primates, a comparison aiming to test the functional link between the presence of more grasping extremities and fine-branch arborealism within primates only is inappropriate. Instead, distantly related mammals that have converged on similar fine-branch niches need to be considered. In doing so, a stronger adaptive model that is general enough to explain the presence of prehensile hands and feet in all mammals inhabiting fine-branch habitats can be built. In the following section, we present the results of morphometric analyses and behavioral observations in laboratory conditions using both comparative methods described earlier: (a) comparisons within a closely related group of mammals that is ecologically diverse; in this case, five species of didelphid marsupials and (b) comparisons between two distantly related groups of mammals that have converged ecologically; in this case, some didelphid marsupials and cheirogaleid primates.